Osaka – When a pathogen evades or overcomes our innate immune defenses, the adaptive immune system kicks into action. There are two types of adaptive immune responses: cell-mediated immunity mediated by T cells and humoral immunity mediated by antibodies produced by B cells. 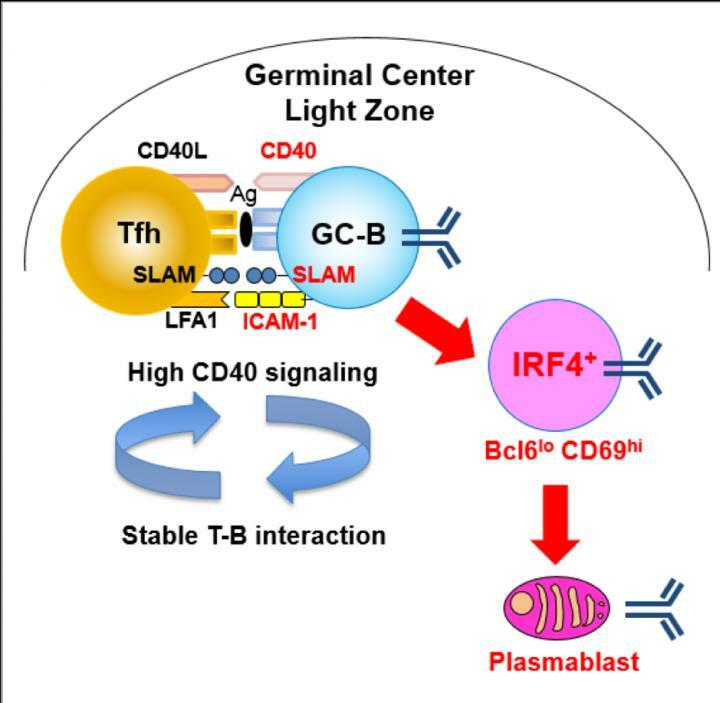 Affinity maturation of B cells in the germinal center (GC) is a process of evolution involving mutation of B cell receptors (BCRs) followed by selection through antigens and T cells. Consequently, an important GC function is to make the most effective antibodies possible, thereby providing efficient immune protection. In GCs, B cells migrate between two zones, the light zone (LZ) and dark zone (DZ). Immune cells such as antigen-presenting follicular dendritic cells and T follicular helper (Tfh) cells reside in the LZ, and it is also here GC B cells expressing newly mutated BCRs capture antigen and internalize it for presentation to T cell. Subsequently, higher-affinity cells are directed to the plasma cell fate, whereas lower-affinity cells enter into the recycling GC cell pool. Plasma cells are fully differentiated B cells that produce a single type of antibody. While it has been suggested that precursor cells (selected toward recycling GC or plasma cell fates) become committed already in the GCs, it is unclear how the plasma cell-prone GC cells develop. Clarifying these mechanisms will be valuable in developing effective vaccines to prevent viral infections such as influenza. A team of Osaka University-centered researchers set out to uncover this mystery, and reported its study in the journal, Immunity. "In a mouse model, we were able to identify a small population of LZ GC B cells (Bcl6loCD69hi) with higher BCR affinity than other identified GC subpopulations. These Bcl6loCD69hi cells were preferentially committed to the plasma cell fate rather than to recycling in the GC," study first author Wataru Ise explains. "We also found that CD40 acted as a dose-dependent regulator of Bcl6loCD69hi cell formation." The researchers also noted the expression of the proteins ICAM-1 and SLAM in Bcl6loCD69hi cells was higher than in Bcl6hiCD69hi cells, therefore affording more stable Tfh-GC B cell contacts. The results support the model whereby commitment to the plasma cell begins in the GC and suggest that stability of Tfh-GC B cell contacts is key for plasma cell-prone GC cell formation. "Our data not only provided important information for vaccines development, but also open up new doors for further study," study corresponding author Tomohiro Kurosaki says. "The two important questions to address are: why Bcl6loCD69hi cells with higher c-Myc expression manifested less proliferation activity than Bcl6hiCD69hi cells, and why the Bcl6loCD69hi plasma cell-prone GC cells barely express Blimp-1, given the previous evidence that IL-21-mediated Stat3, together with IRF4, activates Blimp-1."